This four-sided table throw helps hide stored materials while enhancing your booth's appearance. Closed-back table cover creates a tidy appearance from all angles as people walk around tables. 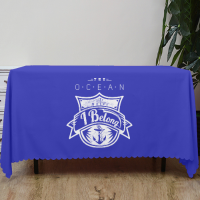 Heavy Duty Polyester Material with Directly Printing. Closed-back table cover creates a tidy appearance from all angles as people walk around or between tables. Corners drape elegantly for the perfect finishing touch to your display! Made of durable, wrinkle-resistant, easy-to-clean, flame-retardant 5-oz polyester poplin fabric. Lightweight, so it's convenient for traveling and cost-effective when shipping. Perfect for trade shows, job fairs or any event! 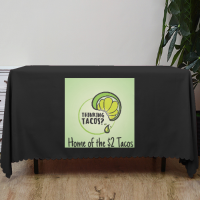 Size: throw is 88" x 154" (covers standard 8' table size 28" x 96" x 30"). 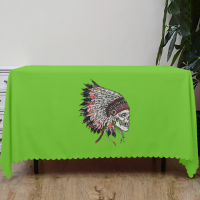 Size: throw is 88" x 130" (covers standard 6' table size 28" x 72" x 30"). 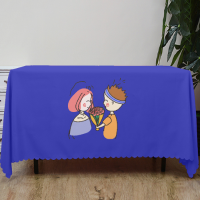 The table cover is very well! I have ordered this product from Brightent because I like the designs. It is lovely and cute. It is good for the party. Perfect! Love it!!! 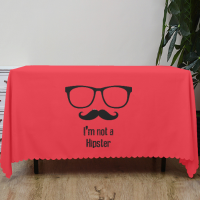 I have had it on my kitchen table for 3 weeks now, and all I have to do is wipe the spills, and my tablecloth is clean! It is amazing! 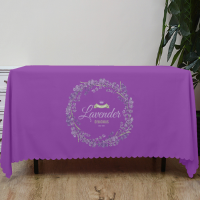 It's a great tablecloth and a offered at a great price. The printing of image turned out great. Great price and good quality with a nice consistent color I purchased 5 of these for an event and they came quickly and were well packaged. The Print of it is very Clear and exactly as pictured.I will buy from Brightent for sure in the future! Very great product and fit for my set very well, the image is really which I love very much. The quality is very good and beyond my expectations! Thanks for your feedback and great info, it's really our honor! Great item..great value..Great customer service! Fit great, Arrived on time will buy again. Buy the way the printing is very excellent and cool!